acetabulum—depression of the coxal bone that articulates with the head of the femur. annul-, ring: annular ligament— ring-shaped band of connective tissue below the elbow joint that encircles the head of the radius. arth-, joint: arthrology—study of joints and ligaments. burs-, bag, purse: prepatellar bursa—fluid-filled sac between the skin and the patella. condyl-, knob: medial condyle— rounded bony process at the distal end of the femur. fov-, pit: fovea capitis—pit in the head of the femur to which a ligament is attached. glen-, joint socket: glenoid cavity—depression in the scapula that articulates with the head of the humerus. labr-, lip: glenoidal labrum—rim of fibrocartilage attached to the margin of the glenoid cavity. ov-, egglike: synovial fluid— thick fluid within a joint cavity that resembles egg white. syndesmosis—type of joint in which the bones are held together by long fibers of connective tissue. 1. Explain how joints can be classified according to the type of tissue that binds the bones together. 2. Describe how bones of fibrous joints are held together. 3. Describe how bones of cartilaginous joints are held together. 4. Describe the general structure of a synovial joint. 5. List six types of synovial joints, and name an example of each type. 6. Explain how skeletal muscles produce movements at joints, and identify several types of joint movements. 7. Describe the shoulder joint, and explain how its articulating parts are held together. 8. Describe the elbow, hip, and knee joints, and explain how their articulating parts are held together. 9. Describe the life-span changes in joints. G blocks recycling of two of the four DNA nucleotides called purines. As a result, uric acid crystals accumulate In joints, causing great pain. In humans, gout mostly affects the small joints In the foot, usually those of the large toes. For many years, gout was attributed solely to eating a great deal of red meat, which Is rich in purines. Today we know that while such a diet may exacerbate gout, a genetic abnormality causes the illness. Yet researchers recently discovered evidence that is consistent with the association of gout with eating red meat—signs of the condition in Tyrannosaurus rex! An arthritis specialist and two paleontologists examined a cast of the right forearm of a dinosaur named Sue, a long-ago resident of the Hell Creek Formation in South Dakota, whose fossilized remains were found in 1990 jutting from the ground. Although telltale uric acid crystals had long since decomposed, X rays revealed patterns of bone erosion that could have resulted only from gout. The researchers examined only Sue's forearm, however, because she had been discovered on native American land and had been illegally traded by a fossil dealer. As a result of this dubious background, the Federal Bureau of Investigation had confiscated Sue. So the researchers examined bones from 83 other dinosaurs, but found evidence of gout in only one other individual. Sue had a hard life. Her facial bones and a lower limb bone were broken, and a tooth was found embedded in a rib, a legacy of an ancient battle. Whatever the reason for her injuries, Sue may have experienced the same kind of persistent pain that humans do. She is now on display at the Field Museum in Chicago. Joints, or articulations (ar-tik'u-la"shunz), are functional junctions between bones. 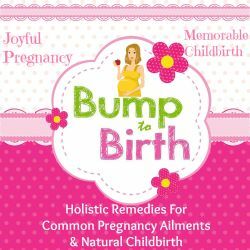 They bind parts of the skeletal system, make possible bone growth, permit parts of the skeleton to change shape during childbirth, and enable the body to move in response to skeletal muscle contractions. Joints vary considerably in structure and function. However, they can be classified by the type of tissue that binds the bones at each junction. Three general groups are fibrous joints, cartilaginous joints, and synovial joints. Joints can also be grouped according to the degree of movement possible at the bony junctions. In this scheme, joints are classified as immovable (synarthrotic), slightly movable (amphiarthrotic), and freely movable (diarthrotic). The structural and functional classification schemes overlap somewhat. Currently, structural classification is the one most commonly used. The articulation between the distal ends of the tibia and fibula is an example of a syndesmosis. 1. Syndesmosis (sin" des-mo'sis). In this type of joint, the bones are bound by long fibers of connective tissue that form an interosseous ligament. Because this ligament is flexible and may be twisted, the joint may permit slight movement and thus is amphiarthrotic (am"fe-ar-thro'tik). 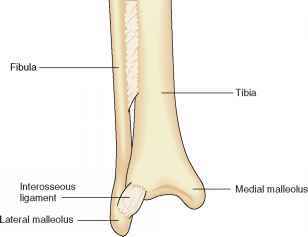 A syndesmosis is at the distal ends of the tibia and fibula, where they join to form the tibiofibular articulation (fig. 8.1). 2. Suture (su'chur). Sutures are only between flat bones of the skull, where the broad margins of adjacent bones grow together and unite by a thin layer of dense connective tissue called a sutural ligament. Recall from chapter 7 (page 223) that the infantile skull is incompletely developed, with several of the bones connected by membranous areas called fontanels (see fig. 7.33). These areas allow the skull to change shape slightly during childbirth, but as the bones continue to grow, the fontanels close, and sutures replace them. With time, some of the bones at sutures interlock by tiny bony processes. Such a suture is in the adult human skull where the parietal and occipital bones meet to form the lambdoidal suture. Because they are immovable, sutures are synarthrotic (sin'ar-thro'tik) joints (figs. 8.2 and 8.3). (a) The fibrous joints between the bones of the cranium are immovable and are called sutures. (b) A sutural ligament connects the bones at a suture. (a) Sutures between the parietal and occipital bones of the skull. (b) The inner margin of a parietal suture. The grooves on the inside of this parietal bone mark the paths of blood vessels located near the brain's surface. 3. Gomphosis (gom-fo'sis). A gomphosis is a joint formed by the union of a cone-shaped bony process in a bony socket. 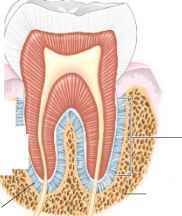 The peglike root of a tooth fastened to a jawbone by a periodontal ligament is such a joint. This ligament surrounds the root and firmly attaches it to the jaw with bundles of thick collagenous fibers. A gomphosis is a synarthrotic joint (fig. 8.4). D What is a joint? ^9 How are joints classified? ^9 Describe three types of fibrous joints. What is the function of the fontanels? The articulation between the root of a tooth and the jawbone is a gomphosis. The articulation between the first rib and the manubrium is a synchondrosis. movement no longer occurs at the joint. Thus, the joint is synarthrotic (see fig. 7.11). Another synchondrosis occurs between the manubrium (sternum) and the first rib, which are directly united by costal cartilage (fig. 8.5). This joint is also synarthrotic, but permanent. 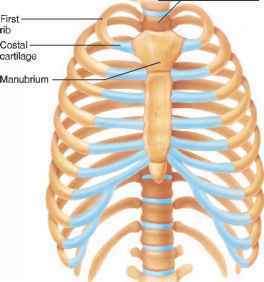 The joints between the costal cartilages and the sternum of ribs 2 through 7 are usually synovial joints. 2. Symphysis (sim'fi-sis). The articular surfaces of the bones at a symphysis are covered by a thin layer of hyaline cartilage, and the cartilage, in turn, is attached to a pad of springy fibrocartilage. A limited amount of movement occurs at such a joint whenever forces compress or deform the cartilaginous pad. An example of this type of joint is the symphysis pubis in the pelvis, which allows maternal pelvic bones to shift as an infant passes through the birth canal (fig. 8.6a). 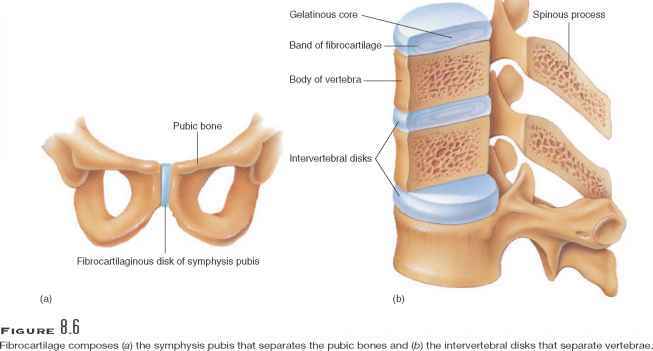 The joint formed by the bodies of two adjacent vertebrae separated by an intervertebral disk is also a symphysis (fig. 8.6fo and reference plate 51). Each intervertebral disk is composed of a band of fibrocartilage (annulus fibrosus) that surrounds a gelatinous core (nucleus pulposus). The disk absorbs shocks and helps equalize pressure between the vertebrae when the body moves. Since each disk is slightly flexible, the combined movement of many of the joints in the vertebral column allows the back to bend forward or to the side or to twist. Because these joints allow slight movements, they are amphiarthrotic joints. Most joints of the skeletal system are synovial (si-no've-al) joints, and because they allow free movement, they are diarthrotic (di"ar-thro'tik). These joints are more complex structurally than fibrous or cartilaginous joints. 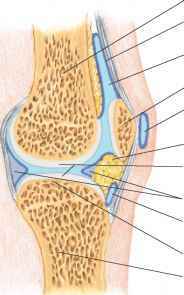 They consist of articular cartilage, a joint capsule, and a synovial membrane, which secretes synovial fluid. Virtuoso violinist Niccolo Paganini (1782-1840) astounded concertgoers with his ability to reach three octaves across the bridge of his instrument. So lax were his joints that he could bend his thumb backward until the nail touched the back of his hand. Paganini had "benign joint hypermobility syndrome," defined as a range of motion much greater than normal. Today the condition is studied in people whose professions make lax joints either a benefit or a liability. In athletes and dancers, for example, loose joints increase the risk of injury. Musicians are especially interesting. The nimble fingers, hands, and wrists of hypermobility syndrome help woodwind and string players, but lax joints also tend to cause back and knee problems. Rather than gaining strength from repetitive movements of playing instruments, these joints must bear weight from long hours of sitting in one position. Perhaps rock guitarists make the best use of hypermobile joints. They stretch their fingers like Paganini while jumping about onstage to better distribute their weight on the other joints! The articular ends of the bones in a synovial joint are covered with a thin layer of hyaline cartilage (fig. 8.7). This layer, which is called the articular cartilage, resists wear and minimizes friction when it is compressed as the joint moves. Typically, the bone beneath articular cartilage (subchondral plate) contains cancellous bone, which is somewhat elastic (fig. 8.7). This plate absorbs shocks, helping protect the joint from stresses caused by the load of body weight and by forces produced by contracting muscles. Excessive mechanical stress due to obesity or certain athletic activities may fracture a subchondral plate. Although such fractures usually heal, the bone that regenerates may be less elastic than the original, reducing its protective function. 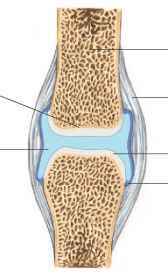 A tubular joint capsule (articular capsule) that has two distinct layers holds together the bones of a synovial joint. The outer layer largely consists of dense connective tissue, whose fibers attach to the periosteum around the circumference of each bone of the joint near its articular end. Thus, the outer fibrous layer of the capsule completely encloses the other parts of the joint. It is, however, flexible enough to permit movement and strong enough to help prevent the articular surfaces from being pulled apart. The generalized structure of a synovial joint. help bind the articular ends of the bones. Some ligaments appear as thickenings in the fibrous layer of the capsule, whereas others are accessory structures located outside the capsule. In either case, these structures help prevent excessive movement at the joint. That is, the ligament is relatively inelastic, and it tightens when the joint is stressed. The inner layer of the joint capsule consists of a shiny, vascular lining of loose connective tissue called the synovial membrane. This membrane, which is only a few cells thick, covers all of the surfaces within the joint capsule, except the areas the articular cartilage covers. The synovial membrane surrounds a closed sac called the synovial cavity, into which the membrane secretes a clear, viscous fluid called synovial fluid. In some regions, the surface of the synovial membrane has villi as well as larger folds and projections that extend into the cavity. Besides filling spaces and irregularities of the joint cavity, these extensions increase the surface area of the synovial membrane. The membrane may also store adipose tissue and form movable fatty pads within the joint. This multifunctional membrane also reabsorbs fluid, which is important when a joint cavity is injured or infected. Synovial fluid has a consistency similar to uncooked egg white, and it moistens and lubricates the smooth cartilaginous surfaces within the joint. It also helps supply articular cartilage with nutrients that are obtained from blood vessels of the synovial membrane. The volume of synovial fluid in a joint cavity is usually just enough to cover the articulating surfaces with a thin film of fluid. The amount of synovial fluid in the cavity of the knee is 0.5 mL or less. A physician can determine the cause of joint inflammation or degeneration (arthritis) by aspirating a sample of synovial fluid from the affected joint using a procedure called arthrocentesis. Bloody fluid with lipid on top indicates a fracture extending into the joint. Clear fluid is found in osteoarthritis, a degeneration of collagen in the joint that is inherited or degenerative. Cloudy, yellowish fluid may indicate the autoimmune disorder rheumatoid arthritis, and crystals in the synovial fluid signal gout. If the fluid is cloudy but red-tinged and containing pus, a bacterial infection may be present that requires prompt treatment. Normal synovial fluid has 180 or fewer leukocytes (white blood cells) per cubic mm. If the fluid is infected, the leukocyte count exceeds 2,000. Some synovial joints are partially or completely divided into two compartments by disks of fibrocartilage called menisci (me-nis'ke) (sing., meniscus) located between the articular surfaces. Each meniscus attaches to the fibrous layer of the joint capsule peripherally, and its free surface projects into the joint cavity. In the knee joint, crescent-shaped menisci cushion the articulating surfaces and help distribute body weight onto these surfaces (fig. 8.8). Menisci separate the articulating surfaces of the femur and tibia. Several bursae are associated with the knee joint. inner lining of synovial membrane, which may be continuous with the synovial membrane of a nearby joint cavity. These sacs contain synovial fluid and are commonly located between the skin and underlying bony prominences, as in the case of the patella of the knee or the olecranon process of the elbow. Bursae cushion and aid the movement of tendons that glide over bony parts or over other tendons. The names of bursae indicate their locations. Figure 8.8 shows a suprapatellar bursa, a prepatellar bursa, and an infrapatellar bursa. H Describe two types of cartilaginous joints. What is the function of an intervertebral disk? Describe the structure of a synovial joint. What is the function of the synovial fluid? Articular cartilage, like other cartilaginous structures, lacks a direct blood supply (see chapter 5, page 156). Surrounding synovial fluid supplies oxygen, nutrients, and other vital chemicals. Normal body movements force these substances into the joint cartilage. When a joint is immobilized or is not used for a long time, inactivity may cause degeneration of the articular cartilage. The degeneration may reverse when joint movements resume. However, it is important to avoid exercises that greatly compress the tissue during the period of regeneration. Otherwise, chondrocytes in the thinned cartilage may be injured, hindering repair. The articulating bones of synovial joints have a variety of shapes that allow different kinds of movement. Based upon their shapes and the movements they permit, these joints can be classified into six major types—ball-and-socket joints, condyloid joints, gliding joints, hinge joints, pivot joints, and saddle joints. 1. A ball-and-socket joint consists of a bone with a globular or slightly egg-shaped head that articulates with the cup-shaped cavity of another bone. Such a joint allows a wider range of motion than does any other kind, permitting movements in all planes, as well as rotational movement around a central axis. The hip and shoulder contain joints of this type (fig. 8.9a). 2. In a condyloid joint, the ovoid condyle of one bone fits into the elliptical cavity of another bone, as in the joints between the metacarpals and phalanges. This type of joint permits a variety of movements in different planes; rotational movement, however, is not possible (fig. 8.9b). 3. The articulating surfaces of gliding joints are nearly flat or slightly curved. These joints allow sliding or back-and-forth motion and twisting movements. Most of the joints within the wrist and ankle, as well as those between the articular processes of adjacent vertebrae, belong to this group (fig. 8.9c). The sacroiliac joints and the joints formed by ribs 2 through 7 connecting with the sternum are also gliding joints. 4. In a hinge joint, the convex surface of one bone fits into the concave surface of another, as in the elbow and the joints of the phalanges. Such a joint resembles the hinge of a door in that it permits movement in one plane only (fig. 8.9d ). 5. In a pivot joint, the cylindrical surface of one bone rotates within a ring formed of bone and fibrous tissue of a ligament. Movement at such a joint is limited to rotation around a central axis. The joint between the proximal ends of the radius and the ulna, where the head of the radius rotates in a ring formed by the radial notch of the ulna and a ligament (annular ligament), is of this type. Similarly, a pivot joint functions in the neck as the head turns from side to side. In this case, the ring formed by a ligament (transverse ligament) and the anterior arch of the atlas rotates around the dens of the axis (fig. 8.9e). 6. A saddle joint forms between bones whose articulating surfaces have both concave and convex regions. The surface of one bone fits the complementary surface of the other. This physical relationship permits a variety of movements, mainly in two planes, as in the case of the joint between the carpal (trapezium) and the metacarpal of the thumb (fig. 8.9/). Table 8.1 summarizes the types of joints. Skeletal muscle action produces movements at synovial joints. Typically, one end of a muscle is attached to a relatively immovable or fixed part on one side of a joint, and the other end of the muscle is fastened to a movable part on the other side. When the muscle contracts, its fibers pull its movable end (insertion) toward its fixed end (origin), and a movement occurs at the joint. flexion (flek'shun) Bending parts at a joint so that the angle between them decreases and the parts come closer together (bending the lower limb at the knee). extension (ek-sten'shun) Straightening parts at a joint so that the angle between them increases and the parts move farther apart (straightening the lower limb at the knee). hyperextension (hi"per-ek-sten'shun) Excess extension of the parts at a joint, beyond the anatomical position (bending the head back beyond the upright position). dorsiflexion (dor"si-flek'shun) Bending the foot at the ankle toward the shin (bending the foot upward). plantar flexion (plan'tar flek'shun) Bending the foot at the ankle toward the sole (bending the foot downward). abduction (ab-duk'shun) Moving a part away from the midline (lifting the upper limb horizontally to form a right angle with the side of the body). adduction (ah-duk'shun) Moving a part toward the midline (returning the upper limb from the horizontal position to the side of the body). rotation (ro-ta'shun) Moving a part around an axis (twisting the head from side to side). Medial rotation involves movement toward the midline, whereas lateral rotation involves movement in the opposite direction. circumduction (ser"kum-duk'shun) Moving a part so that its end follows a circular path (moving the finger in a circular motion without moving the hand). supination (soo"pi-na'shun) Turning the hand so the palm is upward or facing anteriorly (in anatomical position). pronation (pro-na'shun) Turning the hand so the palm is downward or facing posteriorly (in anatomical position). eversion (e-ver'zhun) Turning the foot so the sole faces laterally. inversion (in-ver'zhun) Turning the foot so the sole faces medially. protraction (pro-trak'shun) Moving a part forward (thrusting the chin forward). What is the cause of aspirated synovial fluid being redtinged and containing pus? How does having lax connective tissue fibers threaten an athlete’s life?